Posted in Wallace on October 10, 2006 at 8:34 pm. Time for your irregularly scheduled Wallace update. As you’ll recall, there are two key things you need for genetic programming (or, more generally, any evolution-like process): chunks of information that gets replicated imperfectly, and a metric for evaluating each chunk’s fitness; the less-fit chunks are discarded, and the more-fit chunks go through the process again. Well, we now have a data representation for our “solutions” to the “playing Super Mario Bros.” problem. While a simple sequence of button presses could’ve worked, it feels like we’re working with recordings rather than organisms. (Actually, we would be; an FCEU movie file is little more than a compressed sequence of button presses.) So if we want better verisimilitude with biological evolution, we want our candidate solutions to be more “alive” than that. So, why not make our solutions computer programs themselves? Ogg Theora video, 938 KB, 37 seconds. Ogg codecs for Windows might be found here. A simple instruction set similar to machine code to build the programs out of. A means for sending button presses to the emulator. A means for reading the game’s memory. A sandbox to prevent a misbehaving program from doing any damage to the actual system. Unlike the instruction set probably used by the computer you’re sitting in front of right now, the VM is a stack-based (as opposed to a register-based) machine. There’s a stack that just about every instruction uses; each instruction pops its arguments off the stack, does its work, and pushes the results onto the stack. This kind of architecture saves us from having to worry about what addressing modes we need for each instruction; everything simply uses the stack. Granted, since the VM I’ve written can work with both 8-bit and 16-bit values (the NES uses an 8-bit processor, but we need 16 bits to easily address all memory locations), the instructions do worry a little about the types of data on the stack. Of course, it would be possible to store type information in the stack as well, but then the instructions all need to be clever about how they handle each possible data type, which makes implementing the VM more error-prone. OK, so I lied; all instructions except the push immediate instructions get their arguments from the stack. Anyway, as you can see from the comments, all this program does is hold the Right and B buttons constantly, and every 20 emulation frames (about every 1/3 of a second) it either presses or releases the A button. 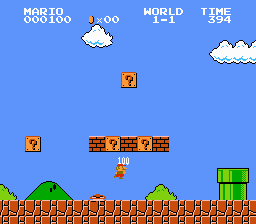 As a result, Mario constantly runs to the right and jumps periodically. It’s surprising how far this 16-line dumb-as-a-post program gets on its second life! So now all that’s left is a way to generate new programs for the VM, making them reproduce and mutate, and pitting them against each other in a battle-to-the-death. Amazing! Amazing! It’s almost complete (version 1 at least). I have to say, this is quite exciting. When does the code get released for download :)? Once I get the last of the main features implemented (which at this point is just the actual genetic algorithm stuff, I think) and fix some known crashers, I’ll make this available. It’s not quite at the state where it does what it claims to do yet.